Known for its dedication to contemporary music across stylistic boundaries, the Momenta Quartet returns to Bates for a concert at 7:30 p.m. Friday, May 9, at the Olin Arts Center Concert Hall, 75 Russell St. Admission is $12, available at batestickets.com. A limited number of free tickets are available for students and seniors 65 and older at bit.ly/oacbates. For more information about this Olin Arts Alive Quartet Series event, please contact 207-786-6163 or olinarts@bates.edu. The quartet also performs the following night as part of a concert of music composed by Bates students for their senior thesis projects. Read about that event. 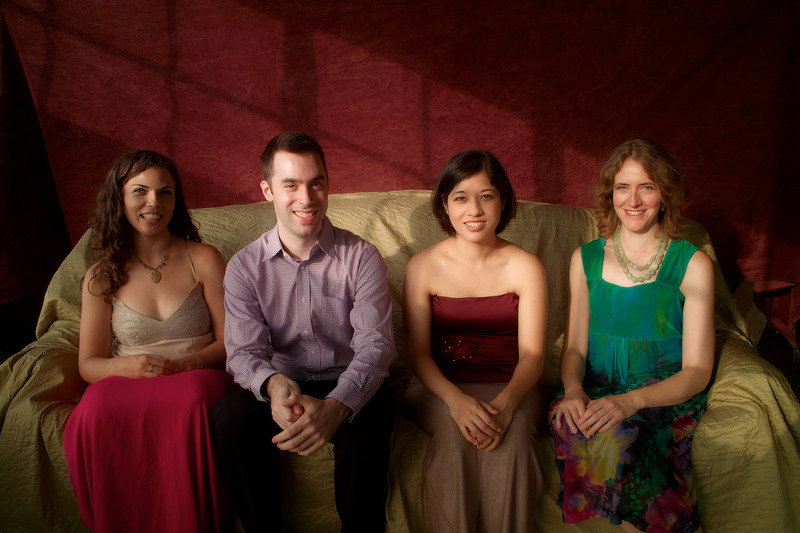 Based in New York City, the Momenta Quartet aims to share the best of contemporary music with its audiences. It focuses on the work of emerging and underrepresented modern composers, and includes music from many different cultures and genres, including jazz and avant-garde improvisation. Praised by The New York Times for its “focused, fluid performance,” the Momenta Quartet has premiered more than 50 works in the past eight years and has collaborated with more than 80 composers. Currently in its ninth year in residence at Temple University in Philadelphia, the quartet has performed and lectured at a number of colleges and universities, including Cornell, Columbia, Swarthmore and Haverford. It has received grants from the Koussevitzky Music Foundation, Meet the Composer, the Aaron Copland Fund, the Brooklyn Arts Council and the New York State Council on the Arts.